Local Lib Dems and Greens have made a reciprocal electoral pact for the Council elections on 2nd May. Each party has agreed that, in certain wards where the other party has more chance of gaining votes, they will not stand a candidate, or only one candidate in a three-seat ward. In announcing the agreement, Nigel Whitburn, Chair of the local Lib Dems, said: "Our two parties feel obliged to make this arrangement in view of the fact that local, county and national elections still use the First Past The Post system, which has resulted in gross distortions of the vote. "For example, in the last local elections in 2015 the Conservatives got only 39% of the vote overall but 79% of the seats; the other parties (Labour, Lib Dems, UKIP and Greens) got 61% of the vote but only 21% of the seats. This is clearly an outdated and unrepresentative system, which both Lib Dems and Greens have opposed for many years." Pat Marsh, Coordinator of local Greens, commented: "We regret that our agreement means that in some wards our supporters won’t have the opportunity of voting Green. However, we urge them to vote for Mike Sole in Nailbourne, who proved his green credentials when he was previously a councillor." "Far more councillors from ‘progressive’ parties are required on Canterbury City Council to make it truly representative of voters in the District," added Mike Sole. "That’s why we're employing the only tactic open to us to try to achieve better representation," commented Alex Stevens, Green candidate for Gorrell. "We hope for voters’ understanding and cooperation in this," he added. "And in the meantime we continue to campaign for proportional representation for future elections." For a group which was set up only a couple of months ago, Extinction Rebellion has already had a significant impact in this country and on Saturday, 5th January it made its presence felt in Canterbury. 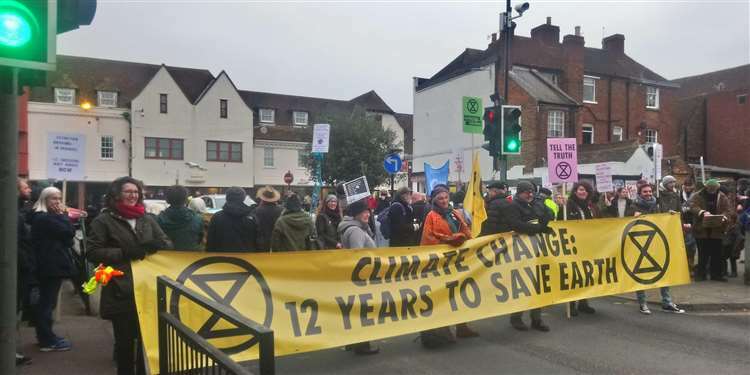 Some hundred campaigners blocked the traffic on St Peter's Place around the West Gate for seven minutes at a time up to 2.30pm, with a large banner stating: Climate Change: 12 Years to Save Earth. A number of Canterbury District Greens have joined Extinction Rebellion and were involved in Saturday's protest. As the local Green Party, we wish to express solidarity with all those involved. We wholeheartedly support the Rebellion's key aim of creating a world that is fit for generations to come. The UN warns we have just 12 years to avoid climate catastrophe. A new report shows we’ve destroyed 60% of all wildlife in the last 40 years. Conventional politics has failed us. That’s why we need to take alternative steps to ensure governments do what is required to save our planet and ourselves. We applaud the work of Extinction Rebellion and all those who took part on Saturday. Ahead of the Canterbury North by-election for Kent County Council on November 15, the Journal invited each of the six candidates to submit a contribution. Here Henry Stanton, the Green Party candidate, shares his thoughts. A vote for the Green Party in Canterbury North is a vote for a county councillor who will combine campaigning for local concerns such as better public transport, better recycling and better cycling infrastructure with continuous pressure on the council to work to combat climate change. Conservative-run Kent County Council started their term of office by voting themselves a 15% pay rise and since then have laid waste to our most important public services. It reduced bus services, made virtually no effort to improve cycling facilities and simply burnt a huge percentage of the household waste that they collect. On top of that, their pension fund continues to invest in companies engaged in fracking, tobacco and fossil fuels. As your county councillor, I would stand alongside our other Green Party councillor, Martin Whybrow, in fighting for a cleaner council and a green Blean and Rough Common. We want to see a reduction in air pollution, an increase in the number of buses, more affordable housing and a genuine, sustainable commitment to fully functional hospitals and medical services across East Kent. All of these things are achievable but just require political will in order to achieve them. Political will that the Tories lack. Ultimately, there is one issue above all others that is now coming to concern all voters – the impact of climate change. Already in Kent we are seeing the impact of it with more extreme weather events, unseasonal temperatures and unpredictable crop yields. The recent UN report on climate change shows that this is only set to get worse. We have 12 years to avoid the truly catastrophic consequences of an above 2 degree rise in global temperatures and if we don’t, the impacts will be felt in Canterbury. Whether it be rising sea levels increasing the incidence of flooding in the area or rising sea temperatures wiping out our famous oyster stocks, even the most mild of temperature rises will affect us here. If we do nothing, we can expect 10 metre sea rises by the end of the century. It’s a gloomy prospect. However, the Green Party knows we can solve the problem if we start now and act locally. Our council has the power to make a difference – by promoting clean public transport, divesting its pension fund of dirty stocks and encouraging sustainable energy production; instead it does nothing. A Green councillor would battle to make all these changes and ensure that Canterbury North remains a beautiful, clean and green place to live. 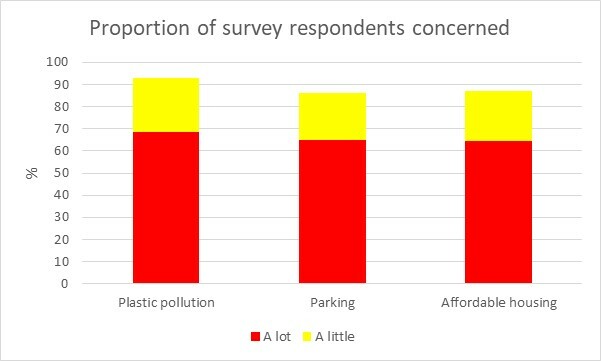 This summer, your local Green Party surveyed residents of Gorrell ward in Whitstable about their views on their community. Thanks to all those who took the time to tell us their views. The results show that people love Whitstable for its strong sense of community, great high street and for being such a friendly neighbourhood. Greens will continue to actively support the Plastic-Free movement, encouraging local businesses to reduce single-use plastic containers and packaging. We would also prioritise multi-compartment bins in Whitstable, especially on the beaches. This would mean an increase in recycling and a decrease in litter. We would campaign for an alternative to the thousands of disposable takeaway cups and glasses being used by the town's cafes, pubs and festivals. The town has serious problems with parking, especially in the summer months when visitors flock to Whitstable. The survey showed support for more residents-only parking in the centre of town. The Green Party will also campaign to get the long-promised out-of-town park and ride facilities set up. Currently the cheapest house prices in the District are more than 13 times the annual salary of the lowest paid, making home ownership an impossible dream for many. Green Party policy is to use forms of housing provision where affordability can be guaranteed, such as social and co-operative housing, and encouraging self-build and custom-build that directly meet peoples’ needs while empowering the builders/occupants. We would also set up a living rent commission, ensure secure tenancies and the Right to Rent if a householder falls behind on mortgage payments. We would campaign to charge 200% council tax on homes left empty for longer than 6 months and set aside the extra revenue received to provide free roof and cavity-wall insulation to residents in the District. “The Council is under a statutory obligation to stop the air pollution that has broken legal limits for the last seven years. This plan will not do its job and a close look at this plan makes it clear that the Council does not take the issue of air pollution seriously enough. Air pollution is taking 750 years of life of our residents every year. It’s the second worst air pollution in Kent. This is a public health emergency and we need action now. The World Health Organisation calls air pollution the world’s “largest single environmental health risk”. Your report claims “nitrogen dioxide (NO2) is the main pollutant of concern”. But the most serious pollution, the PM 2.5 particles, the ones that get into organs, brains and foetuses, you don’t monitor at all. These particles have been linked to poorer memory, attention and vocabulary; to below-average performance on intelligence tests; and to delinquent behaviour. Air pollution has also been implicated in developmental disorders ranging from attention-deficit hyperactivity disorder to autism spectrum disorders. These particles inflame the cells around them and in experiments on mice, the inflammation can be seen a full two months after exposure to air pollution has ended. Your plan states that there is no safe minimum level for PM2.5 air pollution but that you are under no obligation to monitor it. If you choose not to, you are simply not taking this issue seriously. I would urge you to commit to a series of monitoring stations around the city that can report on not just nitrogen dioxide but also PM 10 and 2.5 particles, in real time, in the places we know are worst affected, for example outside St Thomas’s Primary school. The plan is woolly. To look at specifics, statements about rolling out electric charging points in all strategic development sites ring hollow when you’re only planning 10% of spaces in the Station Road West car park to have electric car charging points. Which means that, with a ban on petrol and diesel engine cars arriving in 2040, five years before the car park is even paid for, 90% of spaces won't be fit for purpose. It’s also hard to take the notion of rolling out charging sites across the district seriously when, with a population of 150,000, you’re currently planning a pathetic 9 points. Why, if you are actually serious about doing this are you persisting with building a multi-storey car park which will actually increase the number of car parking spaces in Canterbury and will encourage more cars into Canterbury, rather than fewer? The plan to enhance the cycling and walking network is a good one, if only you would get on with it. There is simply a lack of urgency. Stagecoach are due to move the bus fleet engines to the Euro 6 standard or better by 2023. India is banning the sale of all combustion engines by 2030, so I think Stagecoach can manage electric sooner than this. At the very latest, you should have cleaned up the air by 2022, as stated in the DEFRA action plan for the south east. This plan will not achieve this. Really you should be aiming for 2020. 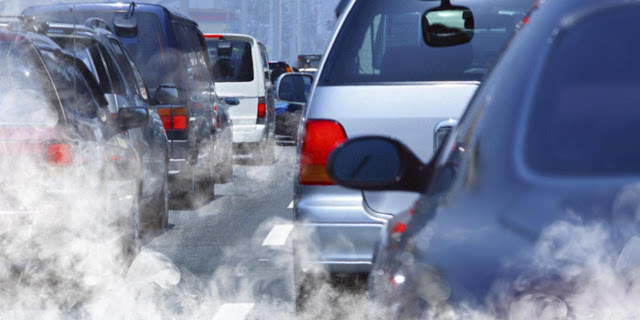 Given that the multi-storey car park will increase emissions, as will the proposed Kingsmead development on top of the 10,000 new homes coming, there is no way this plan will get the air pollution to a legal level by then." 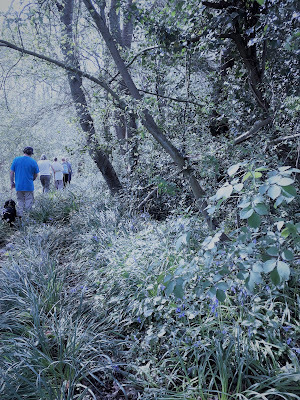 The unseasonal cold weather had made Marilyn Sansom rather apprehensive there would be no bluebells for the walk she organises annually for Green Party members from Canterbury District and Ashford, all proceeds split between our two local parties. 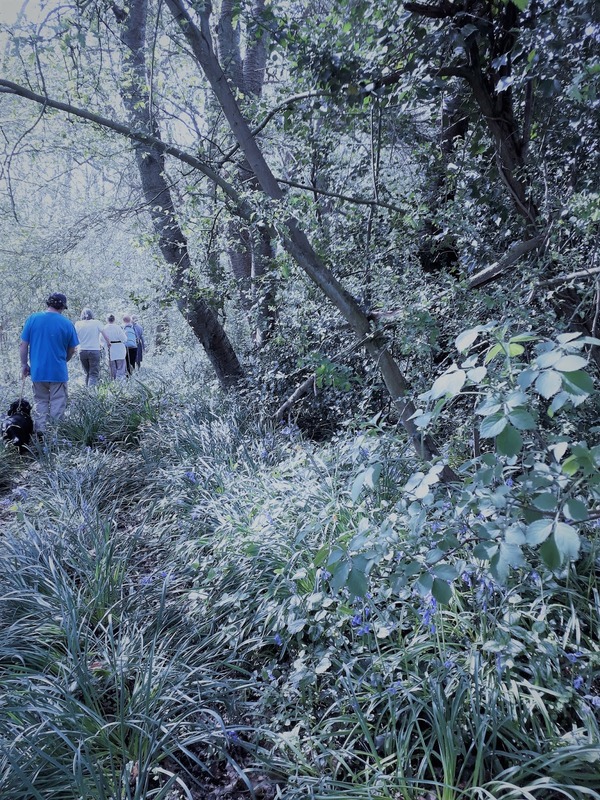 In the event, we had a glorious sunny day with a wonderful display of bluebells, coaxed out of the ground by the hot weather we had during the previous week. Marilyn produced a huge spread of delicious cakes and biscuits, which we all tucked into after the gentle walk through the woods near her house. 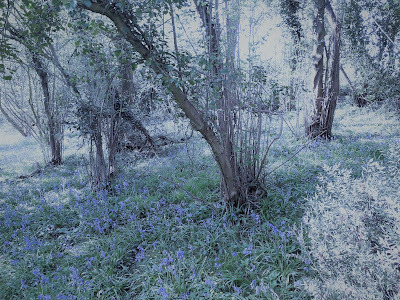 Many thanks again to Marilyn for having organised another enjoyable afternoon in her bluebell woods and in her home. Canterbury District Green Party is delighted that our Council has passed a motion stating it will work to reduce the use of single-use plastics to an absolute minimum. Coming in the week when MPs have proposed a 25p charge on disposable coffee cups, the news of our own Council's decision on reducing single-use plastics makes a really positive start to the new year. 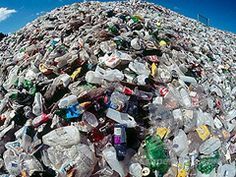 8 million metric tonnes of plastic waste pollute the seas each year and by 2050 the weight of plastic in the oceans is predicted to exceed that of fish, posing a risk to marine life and to human health. In 2016, one third of fish surveyed on our south coast contained plastic... How do your fish and chips taste now? Those of us who watched albatross chicks being fed plastic by parent birds in Blue Planet II will be fully aware of how serious this worldwide problem is. It is sobering to think that the average time a plastic straw is used, for example, is 20 minutes but it'll stay around as a potential hazard for 600 years. We are heartened to find that our Council is taking this problem seriously and planning to reduce its use of single-use plastics, also encouraging local businesses to do the same. We are proud that Canterbury District will be joining the growing number of local authorities all over the world which are taking this action and hope that, when this motion is discussed in the Community Committee, some targets and deadlines can be set for the reduction and eventual banning of single-use plastics usage by the Council and by its service suppliers. The Committee could also encourage all organisations in our District to take the Plastic Free Pledge online, to provide an excellent example to their staff and customers. Perhaps it could also advise dog owners that those two plastic bags they need to have when out with their dogs should be biodegradable.